Frozen shoulder is a condition where the ball and socket joint of the shoulder appears to "freeze". This causes loss of motion with stiffness in all directions. Typically the shoulder joint is stiff and initially painful. It can often start without an apparent cause. It occurs when a loose bag, known as a capsule, which surrounds the shoulder joint, becomes inflamed. The bag then appears to tighten or shrink. This tightening combined with the pain restricts movement in the joint and it can be described as "frozen". There are two main types of frozen shoulder; primary and secondary. In primary frozen shoulder, the exact cause is often not known. It is more common in people with diabetes and with a thyroid gland problem. About 15% of patients link it to a minor injury to the shoulder. A secondary frozen shoulder can develop if the shoulder area is kept still for some time, for example, after a stroke or heart attack. It can also occur after major injury or surgery to the shoulder. Some experts think the inflammation starts with a problem in the shoulder itself, others feel it is related to factors away from the shoulder (e.g. stiff neck, or certain diseases). Research is continuing to try and answer some of the questions surrounding the causes of frozen shoulder. Frozen shoulder is most common in people between the ages of 40 and 70 and tends to occur more often in women than in men. It is estimated to affect at least one person in 50 every year. This amounts to as many as one million people. About one in ten people who develop frozen shoulder will go on to experience similar symptoms in their other shoulder. This normally happens within five to seven years of the first one. However this tends to resolve more quickly than the first. The symptoms of frozen shoulder often reveal themselves in three distinct phases. The pain often starts gradually and builds up. It may be felt on the outside of your upper arm and can extend down to the elbow and even into your forearm. It can be present at rest and is worse on movements of the arm. Sleep is often affected, as lying on it can be painful or even impossible. During this time movements of the shoulder often begin to be reduced. During this phase symptoms may be confused or similar to those of subacromial impingement or rotator cuff problems. The ball and socket joint becomes increasingly stiff, particularly on twisting movements such as trying to put your hand behind your back or head. These movements remain tight even when you try to move the shoulder with your other hand or someone tries to move the shoulder for you. It is the ball and socket joint that is stiff. The shoulder blade is still free to move around the chest wall, and you may become more aware of this movement. The pain and stiffness starts to resolve during this phase, and you can begin to use your arm in a more normal way. The total duration of the process is from 12 to 42 months, although the average period is 18-24 months. The good news is that although the pain and stiffness you experience may be extremely severe, the problem can usually resolve itself. The vast majority of people who have suffered with frozen shoulder find that their symptoms clear up and only a minority report any interference with everyday activities. For some however the symptoms are very severe. Pain and stiffness lead to considerable problems. Mr Cole will discuss other options for treatment at your consultation. An x-ray can provide an excellent "picture" of bones and joints and will show if your shoulder has developed any bone changes. Often this is the only investigation that is needed. If the x ray is normal and the movement is restricted in a typical fashion the likely diagnosis is frozen shoulder. Occasionally, Mr Cole will suggest an MRI scan, usually to exclude other conditions if there is any other concern. There are 2 main treatments for frozen shoulder, nonsurgical (conservative) and surgical treatment. Most frequently treatment for frozen shoulder is non-surgical, although a proportion of people do sometimes require or choose an operation. There is no one agreed treatment option that has been shown to work. Ultimately the shoulder appears to go through the three phases described. The passage of time is often the best treatment. That said, there are treatments that can help you pass through each phase and control difficult areas for you, such as pain. Surgery can increase the range of motion and decrease pain and is generally very successful. You can also try using heat, such as a hot water bottle, or cold (ice packs). Injections into the joint may also be offered if the pain continues. Physiotherapy at this stage is directed at pain relief (heat, cold and other pain relieving therapies such as electrotherapy). Forcing the joint to move can make it more painful and is best not pursued. You can try using a TENS machine (transcutaneous nerve stimulation) which some people find helpful, or try alternative therapies such as acupuncture. Once stiffness is more of a problem than pain, physiotherapy is indicated. You will be shown specific exercises to try and get the ball and socket moving. In addition, your therapist may move the joint for you, trying to regain the normal glides and rolling of the joint. 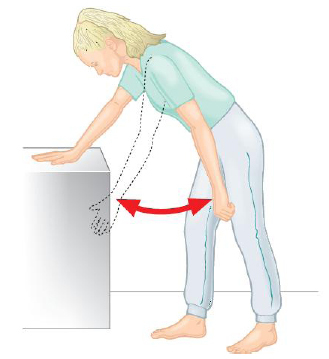 These are known as joint mobilisations. Muscle based movement techniques may also be used. exercises to try and maintain the movement that you do have. Hopefully, as the recovery phase starts you will find that the movement gradually increases. This, again, can be a useful time to have physiotherapy to help maximise the movement. A frozen shoulder is a condition where the ball and socket joint of the shoulder appears to stiffen up and lose movement. This causes loss of motion with stiffness in all directions. Typically the shoulder joint is stiff and initially painful. Pain can be a significant feature of this condition and it can often start without an apparent cause. Most treatment for frozen shoulder is non-surgical, although a very small proportion of people do sometimes require an operation. This is offered to people whose shoulder problem is very slow to resolve or pain is a significant feature. (Remember that frozen shoulder is a self limiting condition which does get better on it's own eventually, however on average it takes 18 months to 2 years to resolve on its own). This operation is performed by keyhole surgery and aims to release the tight capsule of the joint with a special radio-frequency probe. In addition to releasing the frozen shoulder, Mr. Cole will use the arthroscope (miniature camera) to further examine your shoulder joint for any other lesions or injuries. Although MUA is the traditional operation for frozen shoulder, capsular release is safer and more effective than MUA for people who have developed a persistent frozen shoulder after injury, trauma or fractures, as well as for people with diabetes. Your arthroscopic capsular release operation will be completed as day surgery. This means that you won't normally have to stay overnight in hospital. However, you may feel more comfortable if you bring your own dressing gown, slippers and toiletries. You will be having a general anaesthetic. This can make you feel woozy for a short time after the operation, so you will need to arrange for someone to take you home. It is important that you don't eat or drink anything for six hours prior to your admission into hospital, although you may drink water up to two hours prior to admission. Normally you will be given an interscalene nerve block during the operation. This acts as an excellent pain relief and for a short while after your operation your shoulder and arm may feel numb. When this wears off, your shoulder can feel more sore. You will be given some painkillers to take after the operation. When you begin to feel sensation returning to your shoulder (often a "pins and needles" feeling), you should start taking the pain medication that you have been given. Don't wait for your shoulder to start hurting, as pain is best managed before it gets acute. To keep the pain under control, use your medication regularly to begin with. After a couple of days, you can begin to lower the amount you take and then cease the medication altogether once any pain has subsided. If the pain does not seem to get better, or if you need more pain medication, please contact Mr. Cole. Infection. These are usually superficial wound problems. Very rarely deep infection may occur many months after the operation (less than 1%). Rarely damage to the nerves and blood vessels around the shoulder (less than 1%). You will usually be invited to attend an outpatient clinic in the following 2 weeks following your operation, where the wounds will be examined and your dressing removed. After about 6-8 weeks you will be asked to return so that Mr. Cole can check on your progress. You may discuss any concerns you have during these appointments. Alternatively, should you have a concern, you may telephone Mr. Cole's clinic at any time following your operation. Arthroscopic capsular release is performed by keyhole surgery. This means you will only have two to three small puncture wounds. You will not have any stitches, only small sticking plaster strips. Keep the wounds dry until they are healed, which is normally within five to seven days. You can wash or shower and use ice packs, but protect the wounds with a waterproof dressing; these will be given to you on your discharge from hospital. Avoid using spray deodorant, talcum powder or perfumes near or on the wounds until they are well healed. The dressing will normally be removed at your first follow-up appointment. You will be given a sling to wear immediately following the operation. This is for your comfort and can be discarded within a few days. It is very important to take the sling off to start your physiotherapy exercises and prevent the shoulder from becoming stiff again. You might find it more comfortable to wear your sling at night for the first few nights. You may begin driving one week after your operation or when you feel comfortable. Check you can manage all the controls and it is advisable to start with short journeys. You must of course be safe and in control of the car before starting driving. The best time for you to return to work depends on how you feel following the operation and on the type of work you do. If your job is largely sedentary with minimal arm movements close to your body, you may be able to return as soon as one week after your operation. However, if you have a heavy lifting job or one with sustained overhead arm movements you may require a longer period of rehabilitation. It is best to discuss this with Mr. Cole and with your physiotherapy team. Your ability to start these activities will be dependent on pain, range of movement and strength that you have in your shoulder. 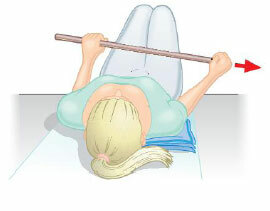 It is wise to avoid sustained or powerful overhead movements (such as trimming a hedge, some DIY, racket sports, front crawl) for a few months. In swimming, for example, you should be able to begin breaststroke as soon as you feel able, but you should wait at least three months before attempting front crawl. It is best to start with short sessions involving little effort and then gradually increase the effort or time for the activity. Your physiotherapy team will be able to give advice tailored to you and your situation. Keeping your hands still, slowly sit backwards towards your heels. There is a great variation between what different people can achieve during their rehabilitation, so don't worry if you cannot do these exercises or if your physiotherapist gives you different exercises to try. A special programme will be devised for you by your physiotherapy team in consultation with Mr. Cole. They will concentrate on increasing the strength and mobility of your shoulder and will be designed for your specific needs. Work hard at your exercises as improvements in strength can increase for up to two years.